The Drexelbrook Usonic-R Series level transmitter provides a level measurement utilizing a non-contact ultrasonic sensor. The Drexelbrook family of ultrasonic technology products offers a line powered version for non-contact level measurement of liquids and slurries for level, distance, volume and open channel flow. 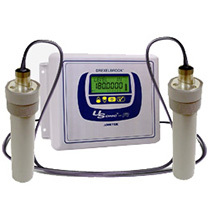 The USonic-R multifunctional level measurement system can be used for a wide range of applications ranging from simple indication of level to more demanding two channel inputs such as differential level and submerged flow. This ultrasonic level transmitter is easy to use. Simply set the measurement range directly in inches, feet, millimeters, centimeters or meters via the menu driven display. The Usonic-R is offered in a two-channel system with 4-20 mA outputs, allows two independent non-contact measurements, or sum or differential measurements. The USonic-R offers Modbus output signal with internal characterizations for Open Channel Flow, Level, Distance and Volume. It also features a wall mounted controller suitable for all Class I Div. 2, Zone 0 locations, with sensors I.S. for Class I Div. 1 locations. The USonic family of ultrasonic level transmitters offers an affordable two wire and line powered level measurement of liquids and slurries for level, distance, volume and open channel flow. Prevention of waste water overflow in sewers is simple using the USonic for a fast and easy solution. The non-contact ultrasonic measurement technology requires no maintenance and offers long lasting solutions that are cost effective.